As the weather starts to get warmer in the northern hemisphere, online sales often slow down as people start logging off from their computers to spend more time outdoors. If you think you might be experiencing this, the first thing to do is figure out if this is a seasonal dip or if there is a different reason for the drop. If you have more than a years worth of sales data, create a graph that shows your sales from one year to the next. You can do this yourself using a spreadsheet if you know your way around creating charts from data, or alternatively most dedicated sales tracking programs will generate these for you. 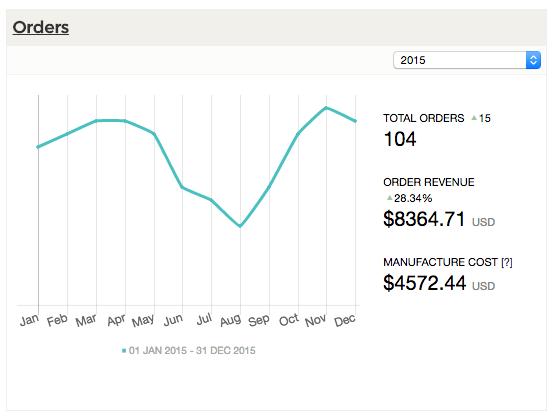 Craftybase's order tracking software (shown above) can be a useful tool for your business to identify your sales trends quickly and easily. If you end up with a chart that looks something like the chart above, then you are most likely dealing with a normal seasonal fluctuation: you can clearly see sales start dipping down in May and start to again pick up in September. An important thing above anything else is to not panic and make rash decisions. Cutting your prices or deep discounting can have little effect apart from cutting your own bottom line, which is exactly what you'll want to avoid when cashflow is temporarily decreased. Use the opportunity to refocus on your product line - analyse what sold well in the past year and what didn't sell so well so you can plan your production for the upcoming year. Look into adding new products: contact some of your past customers to get feedback about what sort of products they would like to see in your shop next. Take the time to do some market research to find out more about similar products and current trends. Take the time to refresh your product photography and make improvements to your packaging. Make some tweaks to your SEO and listings on your sales channels. Analyse your traffic to see what people are searching for and see if you can improve your product listings so that more people viewing your listings convert into happy paying customers. For Etsy sellers: more tips on how to improve your listing visibility. While you should avoid the temptation to reduce your prices, you should take the time to tweak and assess your prices. Adding some higher priced items to your current offering can work well in times of low traffic: if you only make a handful of sales, then its best to maximise your average sale price. 5. Prepare and get organised! Focus on making stock for the next busy period so you are ready for the sales when they start rolling in again - remember to be making stock suitable for selling after summer and during the Nov-Dec holiday period. Also make sure to stock up on your packaging materials to have enough for the holiday period. Declutter your workarea and introduce improvements to your manufacturing and packing workflow to make things faster and more efficient. This could mean buying new boxes or containers for holding your materials or introducing a calendar on your wall to track what you need to manufacture and ship. Now's also the time to sort out your materials. Stocktake everything you use so that know how much you have available right now for your manufactures and how much you have to reorder. 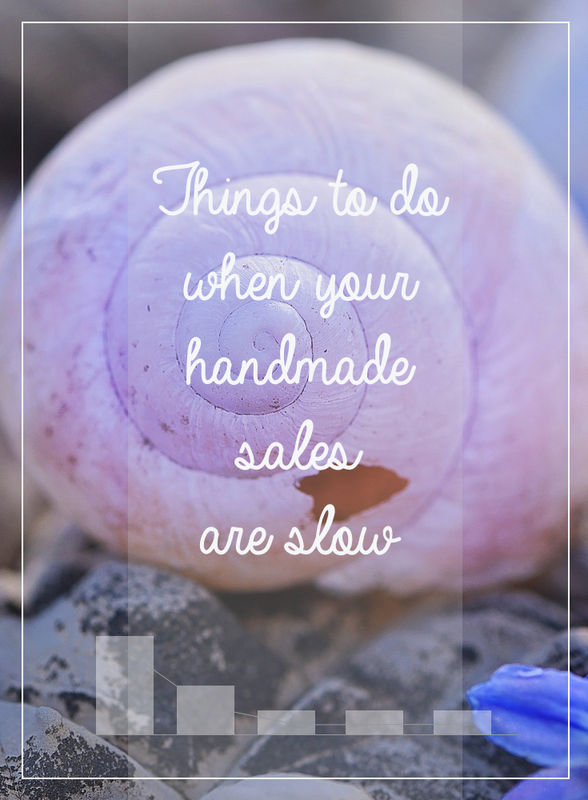 You can use a paper notebook, a spreadsheet, or alternatively a dedicated inventory management system for handmade sellers like Craftybase for this task. Getting your inventory under control now and keeping on top of it throughout the year means much less stress when tax time rolls around. Focus on your online social presence and make sure that you are active and visible. Progress shots of your manufacturing process can be a good way of keeping your twitter, facebook and pinterest accounts alive. Reach out to bloggers with news of your product range and get involved in online communities. We know we mentioned this one as our first point, but it's so important that we thought we would mention it again. Although it's easy to see a drop in sales as the "beginning of the end" for your business it's the most unhelpful thing you can do in the long run. Breathe, then take the time to improve on your business during this quiet period. Remember also to take some time out for yourself while you can!